​Donna Chisholm, PT, RYT-200 is a licensed physical therapist (PT) and Registered Yoga Teacher (RYT) with more than 25 years of clinical experience in physical therapy. She received her degree in physical therapy from Texas Woman’s University in 1989. Her clinical experience includes practicing in acute care hospital settings, home health, skilled nursing facilities, neurological and orthopedic clinical settings, as well as private practice. Donna also has had teaching experience in a college university setting at Northeastern University in Boston, MA as faculty member within their accredited physical therapy program. Donna received her yoga teacher training certification through Radiant Health Yoga at Central Oregon Community College in Bend, Oregon and has been practicing yoga for over 20 years. Donna integrates her clinical knowledge of physical therapy, functional anatomy, and alignment principles with her understanding of yoga. Her areas of emphasis include: injury prevention, geriatric rehabilitation, fall prevention, therapeutic yoga rehabilitation, postural analysis, and correction of musculo-skeletal imbalances. 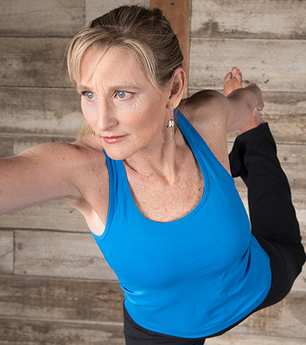 Donna started her physical yoga therapy journey as a competitive runner starting in middle school. She placed third overall in the Massachusetts state cross-country championships. She started a girls’ soccer team and was soon elected to be team captain. She received her first physical therapy treatment for her running injuries in junior high school. Donna personally experienced the benefits of integrating yoga and physical therapy while recovering from a car accident in 2000 in which she sustained a severe back and neck injury. ​Donna attended Texas Woman’s University to study physical therapy from 1984 to 1989. During this time her athletic pursuits evolved to running marathons and cycling in 100-mile century rides. She graduated with a degree in physical therapy in 1989 and accepted a position at Baylor University Medical Center, a teaching hospital in Dallas, TX. After several years at the hospital in Dallas and four years as a traveling physical therapist in California and Hawaii, Donna landed in Palo Alto, California to work at a sports medicine clinic. Donna first became aware of the personal benefits of yoga as a competitive athlete. She reluctantly attended her first class called "Happy Hour Yoga" on a Friday night with the members of the Palo Alto Running Club in Palo Alto, California in 1994. It helped her become better and more efficient in her competitive running, cycling, and soccer. Through yoga, Donna soon realized that everything she was doing was at a fast pace- whether running, cycling, or soccer. She noticed she did not know how to slow down and that was the impetus to start a more committed personal practice in yoga. She began to see the benefits of experiencing the value of slowing down, managing stress, and experienced a tremendous shift in well-being. Donna personally experienced the benefits of integrating yoga with her physical therapy treatments while recovering from a car accident in 2000, in which she sustained a severe back and neck injury. The yoga augmented her PT treatment by improving her strength, range of motion, postural awareness, and muscle imbalances. She noticed that it accelerated her recovery time as well increased her strength and endurance to perform the physical demands of her work. Starting in 1998, Donna’s PT career migrated from sports medicine to home health to allow more treatment time to address the whole person. This home health emphasis would continue through 2013 and also introduced her to the geriatric population which developed into a life–long passion. The multiple medical complexities in today’s geriatric population supported Donna’s quest to incorporate yoga as part of her treatment sessions. The results with her patients included dramatic improvements in balance, strength, postural awareness, and most profoundly, an improved sense of independence and quality of life. Donna moved from Menlo Park, CA to Bend, OR with her son Craig in August 2013 to create a community-based lifestyle. For many years she had desired to become a certified yoga teacher. In Bend she became aware of Radiant Health Yoga’s 200-hour yoga teacher training at Central Oregon Community College. She was drawn to the instructor, Joanna Cashman, and her approach of blending traditional medicine, holistic health, hatha yoga, safe alignment principles, and neurodevelopmental research.